BentoLunch.net - What's for lunch at our house: Preschool Bento #33 - We Got a Pocket Sandwich Maker! 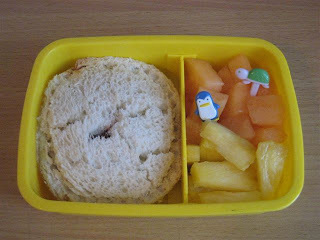 Preschool Bento #33 - We Got a Pocket Sandwich Maker! This is our current favorite kitchen gadget! My sweet friend Lynds is walking the Breast Cancer 3 Day this year and she recently hosted a Pampered Chef party to raise money for her 3Day fund (side note: PC rocks, she raised close to $400 from the party). F&B and I fell in love with this sandwich maker thingie that takes regular sandwiches and makes them similar to Uncrustables. Since both my kids hate peanut butter with a passion but like the *idea* of uncrustables, it works perfectly for them. I really want to try it with egg salad, but I'd have to make the egg salad first. Ben opted for a cream cheese & jelly pocket sandwich along with fresh pineapple & canteloupe. Our bread split a little in making the sandwich, but I think it is because I keep the bread in the fridge. We like Nature's Own White Wheat bread (HCFS free) and I don't think it keeps as long if not refrigerated. Fun! I love my sandwich sealer. It's the only way I'll give my 2yo egg salad sandwiches because otherwise she makes a huge mess sticking her fingers in the sides! Shannon, I got one of these recently and I will be experimenting with various fillings to see how I get on. I might try making pb&j then freezing, like uncrustables, to see how they fare. Oh and my bread split too, it was really fresh so I put it down to too much filling? This reminds me that we only have 3 picks left... My guess is most of them are somewhere in my toddler's room. Where do you get yours? Do Dollar Store type places have them? Aww! Thanks for the mention, Shannon! It was very gracious of you to have the party at your home. Thank you! We've LOVED our sandwich sealer, too. I put more filling in than she showed us at your party because, otherwise, it seemed like the kids were just eating bread. Ekta, you can get it from a Pampered Chef consultant. For the sandwich splitting: I have good luck keeping my bread in the freezer (instead of the fridge) and defrosting it in the microwave before use. If it's really stubborn, boil a cup of water in the microwave first to get the humidity up. K, I hate to even say it (since PC was so awesome helping your friend raise money for such a great cause), but . . . I have one of those and while I *want* to love it, it just seems to fall short of my expectations (like, to *stay* sealed). However, I've been 'coveting' a Krustbuster (yeah, goofy spelling and all) for a while now. I'll let you know how it works out if I take the leap! Wow. Just. WOW. Got the Krustbuster a couple weeks ago and it works SO well! Really *seals* the edges and doesn't split the bread at all in the process! I'm planning on playing with it a good bit (saw a suggestion for using it to make cream cheese stuffed french toast too - mmmm!). Anyone know where I can get a Krustbuster from that will ship to UK without charging an arm and a Leg??? You can buy the product from krustbuster.com. Currently there is a flat shipping rate of just under $ 5.00. Good luck. It really does work. The cream cheese stuffed french toast is mouthwatering delicious!!! Catching up on old old comments (that I forgot to do way back when). Arkonite, did you get one of the Krustbusters? And what did you think of it? We like our PC one, but I'm a complete sucker for kitchen goodies. Hi Shannon, no I haven't managed to get a krustbuster yet, I'm still working on it!